*Note: this is just a couple shoot! Shot on my Nikon d600 with my Sigma 50mm 1.4 and a rented Nikon 85mm 1.8G. The Nikon 85mm turned out to have a back focusing problem which was pretty annoying considering I paid to rent it, but I know it’s a good lens if anyone is ever looking to get it. I’ve been playing around with my editing these days, trying to stray away from the clean bare file and playing with color tones. This past saturday I attended Atlanta’s Flux Night event in the Castleberry Hill art district of Atlanta. From 7pm-Midnight a couple blocks are blocked off from traffic to allow foot traffic to wander around the district and experience all forms of arts. Atlanta’s no where near New York or LA in terms of art culture but you’ve got to appreciate its progression and what it has. The night was full of performance art, galleries, and whatever else you could think of. Best of all, it was free. The night really lets the viewers know the things that go on in the city outside of the big businesses and banks. It’s too bad that this event only happens once a year, but in a way that’s what makes it special and a good reason why you should go next year. All shots were taken with my Fuji x100s. They’re not the greatest but I did my best with the ambient light of the street lights. As a photographer this is a question I get asked A TON. It’s usually people looking for cameras that’ll give them better image quality than their phones and maybe the occasional photography as a hobby or travel camera. 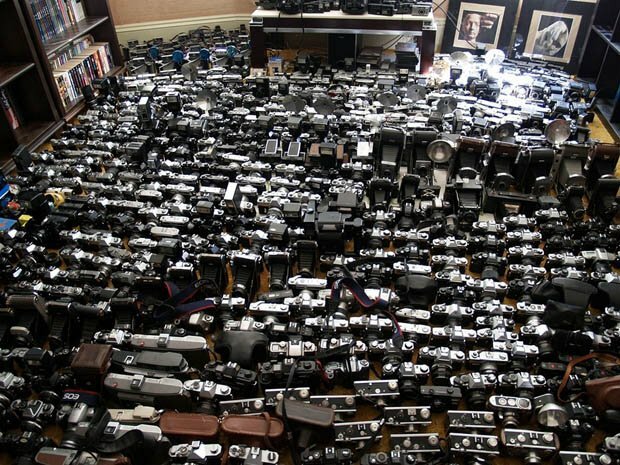 The most common camera we see people with (besides their cell phone) is the DSLR. These are those big, interchangeable lens cameras that you’ve probably seen while being a tourist. I’d like to think that they’re what most people think of getting when they want high quality images. These are actually not what I would recommend for the consumer looking to get a good camera. This past July I traveled to Indonesia and New York City. Both trips required lots of walking around and being out of my hotels/hostels for most of the day. Of course, I brought my DSLR camera, a Nikon D600. It weighs almost 2 pounds without a lens. That actually doesn’t sound like much, but add a lens and a camera bag and you have 5-10 pounds hanging off your neck/shoulder for 3-6 hours. Not to mention the DSLR is huge and moves around a lot, having the potential to hit things like walls or other surfaces. The biggest complaint I hear for why people don’t use their DSLRs is weight and size, so what I would tell people who want a good quality camera is to get a mirrorless camera. These cameras are small cameras that allow you to change lenses like a DSLR, but are smaller. This is because there is no mirror to take up all this space in the body. The picture below explains it better than words. DSLR on the left and Mirrorless on the right. These cameras are just as great as DSLRs. They have most of the same features, are quick, and can be easier to use for the consumer. There are a number of professionals who strictly use mirrorless cameras for their work because of the size and weight convenience. Olympus in fact just released the OMD EM1, a mirrorless camera built for professionals. New mirrorless cameras are released just about each year. Because of this, mirrorless cameras can drop in price pretty quickly as in they don’t hold their value as well as DSLRs since DSLRs are updated about every 3-4 years. Olympus’s standard mirrorless camera, the EP5, currently goes for $999 USD. The generation before that, the EP3 which is still very good, currently sells for about $450. This can be both good and bad depending on how you look at it. So why even buy a DSLR? I still have my D600. It’s my workhorse. It fits my hands well, it has a viewfinder, it’s weather proof, I can depend on it to work, it can survive a drop better, and it gives me the best quality images. There’s a common rule for digital photography: the bigger the sensor, the better the image quality. Cell phones have tiny sensors, so they rank lowest in image quality. Next are the point and shoots, then mirrorless cameras, then cropped sensor DSLRs (consumer level), Full Frame DSLRs (professional level), and finally medium format (super pro level). But don’t let that mean that you need to get a DSLR. To the regular person, he/she won’t be able to tell the difference between the image quality of a mirrorless camera and a DSLR. Mirrorless sensors are only a little smaller than the cropped sensor DSLRs. Some mirrorless cameras like the Sony NEX line even have the same size sensors as consumer level DSLRs. Since my trip to New York, I got a Fuji X100s (pictured below). It’s a fixed lens camera that has a cropped sensor in it. How I wish I had this small camera with me for my trips rather than my DSLR. It’s small, quick, and gives great quality images. Plus I can carry it around with me every where I go without the weight and clunkiness. I’ll save my D600 for my jobs and personal projects. At the end of the day, this is just my opinion and thought. If you aren’t looking to get totally serious into photography but want good images and advance yourself more than the average person, then a mirrorless camera would be great. Then you can carry your small camera with you every where and enjoy photography rather than lug a DSLR around. Hope this post helps! Just wanted to say thanks for the follows and reading my posts. I hope that they keep you interested and that you guys learn something each post. Here is my first video post! Just introducing myself and my gear. Also, I talk a little bit about prefocusing. Enjoy! In the early 1900s, a photographer by the name of Paul Strand will coin the term “straight photography.” Basically this mindset was photographing an image for the sake of what it was. Not for some greater meaning or concept, but just for the image itself. For me, I’m greatly attracted to this principle of just taking an image for what it is. I think too many times we photographers as artists try to make things so conceptual and deep that our images lose visual interest and the image can’t stand on its own without an explanation. I find it perfectly fine to just go out and take pictures and enjoy the moment of doing it. You’re bound to find something interesting to photograph. It’s almost like an adventure for me. Don’t get me wrong though, I think conceptual ideas can make a work of art much stronger. You just got to remember that the work itself should be enjoyable or moving too and not have the words or ideas take over the art itself. Here are some of my recent images that I’ve taken regarding this idea. Also, be sure to follow me on 500px and Twitter! I’ll be sure to follow back. Street photography is something that I only recently picked up. I always had a knack for it. Sometimes I would take a stroll through the middle of the city on Peachtree St. with my D90 and 35mm 1.8 (equates to a 50mm normal lens), but my approach was very reserved and restricted. Another problem was I would ask people for their photographs and therefore ruin the moment that caught my attention in the first place. By searching for various street photographers on Youtube, I came across International Street Photographer Eric Kim posting videos of him shooting in the streets of LA. Contrary to my technique, he was very bold, getting in people’s faces and even using a flash. I should also mention that he was very friendly, saying “thank you” after taking a picture and complimenting his subjects. Just watching his videos alone inspired me to be more brave, but to this day, I’m still working on it and growing in that area. Since then, I’ve changed my technique. Instead of using my D90, I use my Nikon FG film camera with a 50mm 1.8 E Series lens. Granted, it’s no Leica like I wish it was, but it’s much smaller and less intimidating than my D90. Why film and not digital? It’s like what everyone else says: film helps you to slow down and pay more attention to the composition and subject matter instead of just rapid firing away hoping to get one shot. With that being said, I’ll shoot with Kodak Tri-X 400 or Kodak Portra 160VC. Sadly, the cost of film and developing has gone up, so I’ve been considering a Micro Four-Thirds camera lately. I’ve also tried to be more upfront with my subjects. Rather than hide around or sneek a snapshot, I simply show myself taking the picture of the person. I find this approach to be a lot less suspicious. Here are some images of my most recent walk. This photo was taken on Luckie St. where all the restaurants are. This place is perfect for street photography as there’s a good traffic of people from nearby corporate buildings and Georgia State University. I shot this by pointing my camera at the door and waiting for the guy to pass by to shoot. Sort of a Bresson technique. Though the person isn’t in focus, I like how the subject’s movement makes him look ghostly. This photo was shot not too far from the last photo. A square in the city where people will gather to lounge. They even have a place for people to play chess, though I think someone brings this huge chess set on their own. This is probably my most favorite recent shot. After eating lunch with a few friends on Luckie St. I saw this guy around the corner eating alone. His solitude and humble posture caught my eye. Normally I stop down to F11-16 and pre focus, but there wasn’t enough light with the 160VC so I had to take time to actually point the camera at him. I crouched down and acted like I was shooting down the side walk. He glanced at me and I took the photo. *Whew* After that he just kept eating and we went our separate ways. I figure I should start off the first post of my blog with an introduction of who I am and what I do. My name is Peter Ho. I am a freelance photographer based in Atlanta, GA studying for a BFA in Photography at the Savannah College of Art and Design in Atlanta. I received my first camera, a nikon d60, in my senior year of high school. Since then everything spun off and here I am today. I don’t have one focus in photography, but I tend to enjoy shooting studio shots. Recently I’ve also heavily gotten interested in street photography and shoot that with my film camera, a nikon FG. I hope that through this blog, I can help people with varying issues of photography and network with other photographers around the Atlanta area and even the United States.